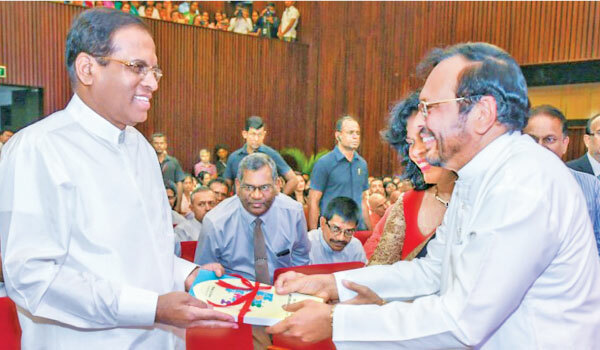 A graduate with vocational skills should be produced to match the local and foreign job market requirements in the university system,President Maithripala Sirisena said at a book launching ceremony held in Colombo on Saturday. “This should not be delayed further by the parties in power,” President told the gathering at the BMICH during the launch of the book titled ‘Sri Lankan education system and the mismatch of the job market’ written by Dr. Mohan Lal Grero. The President further said that the voice for making reformations in the system of education that suits the job market has been raised in the country in the past. It was a long term request and many research reports were released on that issue. The President further pointed out that the era of the graduates raising their voices for jobs will see an end when this problem is properly solved. Dr. Mohan Lal Grero has composed a research thesis called “Sri Lankan education system and the mismatch of the job market,” for his doctorate on the science of education was launched as a book. The book discusses the fundamental capabilities of the Sri Lankan education system and has elaborated on the challenges and the responsibility of the whole educational system.